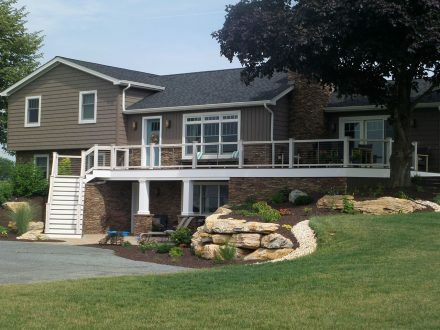 Presented below is a total home renovation project we did in Ronks, PA during the spring of 2013. This was a complete home design and build project. The owner had ideas and pictures from Houzz that they liked. From there, we worked together to create a really neat home. The home is not as big as others in the area, but everyone who enters knows it’s special. From the custom built stairway with cable railing to the master suite and fireplace, it’s a home surrounded by unique features. Our team took part of the existing house roof off to add a cathedral ceiling where the kitchen and living room are. In the back of the house, there is a custom deck with ledger stone and cable railings. Furthermore, we added a small addition in the back of the home for a powder room and laundry area. Our team made the existing garage into a family room and built a new garage with a finished 2nd floor rec room for the children. The client also has a salon shop, so we finished a section of the lower garage and made it into a room for her to work.